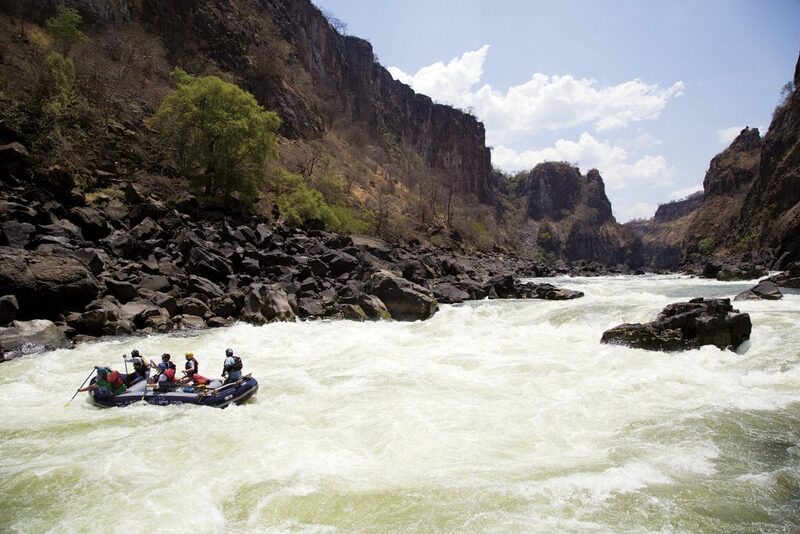 Deep in the Batoka Gorge, the Class V Zambezi River runs wild and free. But for how long? With construction of the Batoka Gorge Dam set to begin in 2017, is this the end of the lifeblood for many Africans? Each year, in late March or early April, the waters of the upper Zambezi River rise. In many parts of the world, such floods would be greeted as a potential catastrophe. But for 250,000 Lozi people, who live by Zambia’s immense Barotse wetlands, the arrival of the life-giving waters is greeted with joy. The floods signal that it’s time for the Litunga King to lead his people to higher ground, inaugurating the colorful, 200-year-old “Kuombekwa” ceremonies. Accompanied by traditional music and dance, the plains dwellers sail all the way to the highlands. These ceremonies reveal a very different attitude towards the natural variations of a river, and they symbolize what makes this river unique. For centuries, people and wildlife have found ways to coexist along the Zambezi, taking nourishment from its waters and honoring its cycles. But in recent decades, that delicate balance has been increasingly threatened. 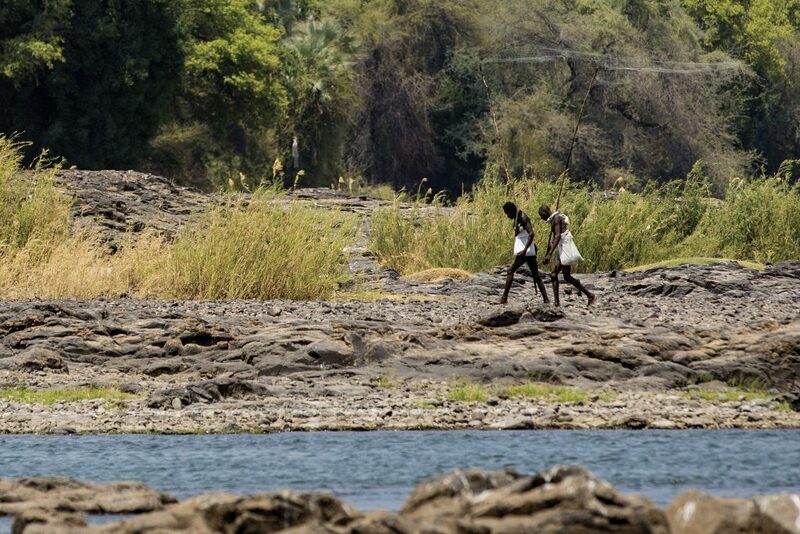 Today, the Zambezi—one of Africa’s most bio-diverse rivers—is also its most dammed river. With 30 dams along its tributaries, and two on its mainstem, the river’s health is in a fragile state—and pressure to build even more dams is mounting. A spectacular, moody waterway that passes through six countries on its path towards the Indian Ocean, the Zambezi is the fourth-longest river in Africa, after the Nile, Congo and Niger rivers. The river is uniquely changeable: in some places, it’s wide and lazy, averaging a width of up to five kilometers; in others, it’s thrilling, passing through narrow, deep gorges. In every part, the river is endowed with amazing floral and faunal biodiversity that’s threatened by development. The river has three distinct stretches: the Upper Zambezi, which flows from its source to Victoria Falls; the Middle Zambezi, which flows from Victoria Falls to the upper reaches of Cahora Bassa reservoir; and the Lower Zambezi, which flows through Cahora Bassa to the Zambezi Delta. The undammed Upper Zambezi, where the Lozi live, remains a pristine wonderland with its vast floodplains and vibrant fishing culture. This stretch of the river is home to artisanal fishing, sport fishing safaris and angling tournaments. Anglers from all over the world are drawn for game fishing of the fighting tigerfish (Hydrocynus vittatus). 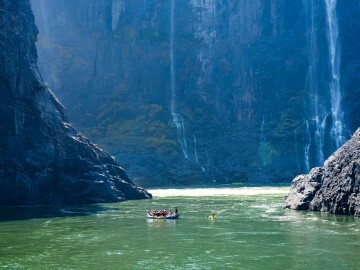 The Middle Zambezi, which forms the border between Zambia and Zimbabwe, is the ragged part of the river, and it’s marked by a plethora of gorges, falls and rapids. (This is the section that famously challenged David Livingstone’s ambition to navigate the mighty river.) 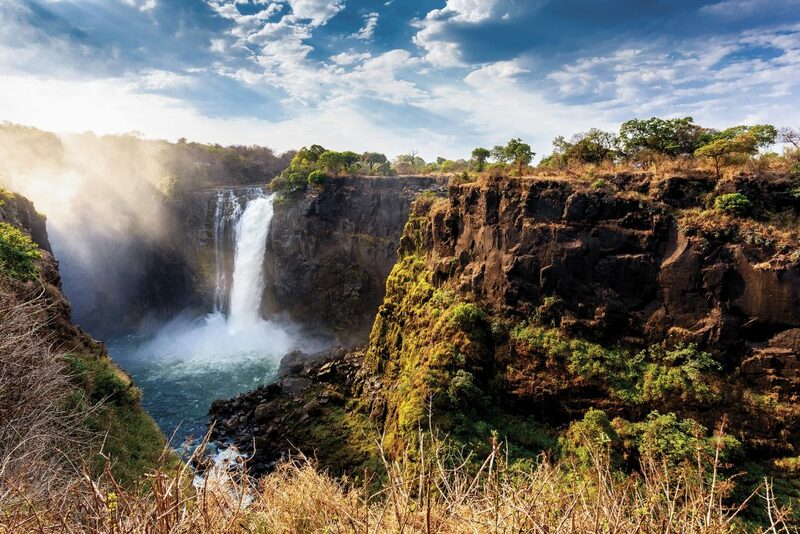 It’s home to magnificent Victoria Falls, the world’s largest waterfall and a UNESCO World Heritage site. The falls are followed by Batoka Gorge, a zig-zagged gorge cut deep into the earth that offers one of the world’s most revered sites for whitewater rafting. Batoka Gorge attracts huge amounts of tourism for both Zambia and Zimbabwe, contributing significantly to the GDP of both countries. The Lower Zambezi includes a second UNESCO World Heritage site: Mana Pools and the Sapi-Chewore game reserves. The Mana Pools floodplain, located in a very dry area of northern Zimbabwe, attracts many large animals, including the “Big Five.” The area is open to tourism—including canoe safaris and fishing—for six months each year. Then, 160 kilometers away from the ocean, the Zambezi Delta begins. At this point, the moody river relaxes, fanning out into four major outlets that spread over a broad valley that extends along a hundred kilometers of shoreline. For centuries, the Zambezi has carried and deposited nutrients to these vast wetlands and coastal mangroves, triggering the lifecycles of countless species. Delta waters swarm with monitor lizards, crocodiles, and pythons, and the floodplain is a haven for migratory waterbirds, including storks, cranes, pelicans, the African openbill and others. Lions, leopards, cheetahs, hyenas and jackals prowl through the landscape. Like many rivers of its size, the Zambezi basin also supports the basic needs of a growing population of over 30 million people. The economies of eight riparian countries depend on it—Angola, Botswana, Malawi, Mozambique, Namibia, Tanzania, Zambia and Zimbabwe. Water-stressed countries like Botswana and South Africa are eyeing its freshwater, and there’s substantial pressure to harness the Zambezi for hydropower development, irrigation, domestic water supply and navigation. Many governments feel hydroelectric dams will solve the water issues and help lift people out of poverty. But dam projects are notoriously expensive and destructive, and they rarely deliver on their promises. Dams along the Zambezi have been particularly fraught with misfortune, and have impoverished as many people—or more—as they’ve helped. A case in point is Kariba Dam. Built in 1958 to bring industrial development to Zambia and Zimbabwe, the dam drowned Gwembe Valley on the Middle Zambezi, displacing over 50,000 formerly self-sufficient Tonga people, who depend on food aid to this day. Water quality has suffered, and now the aging dam wall is at risk of collapse. An estimated $250 million has been secured to make the dam wall safe. To make matters worse, the recent 2015/16 drought has left the reservoir at just 17 percent of capacity. Because of this, power shortages have become chronic in both countries, significantly harming their economies. 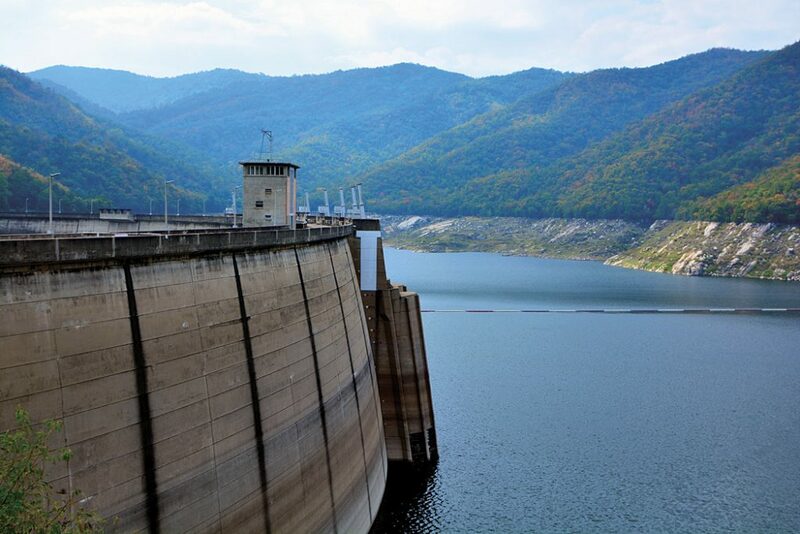 Dams have also fueled conflict in the region. In Mozambique’s Tete province, the Cahora Bassa Dam forms the fourth-largest reservoir on the continent. The hydropower scheme at Cahora Bassa has been a source of disagreement between Portugal and Mozambique for decades, and most of the dam’s electricity is exported to South Africa, bypassing the Mozambican population entirely. Meanwhile, the reservoir’s erratic and mistimed releases of water have decimated the Zambezi Delta, one of the most productive and diverse wetland ecosystems in Africa. The delta is now half its original size due to the impoundments upstream. The dams have reduced flooding and changed the timing of the floods, harming the breeding patterns of fish, birds and other wildlife. 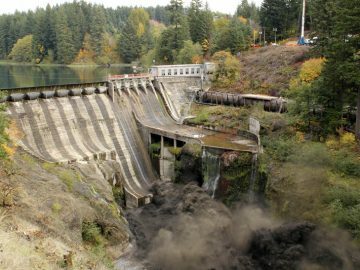 Despite these disastrous experiences, more dam plans are in the works. Batoka Gorge is threatened by a dam of the same name. The Mozambican government is targeting Lupata Gorge for dam development. 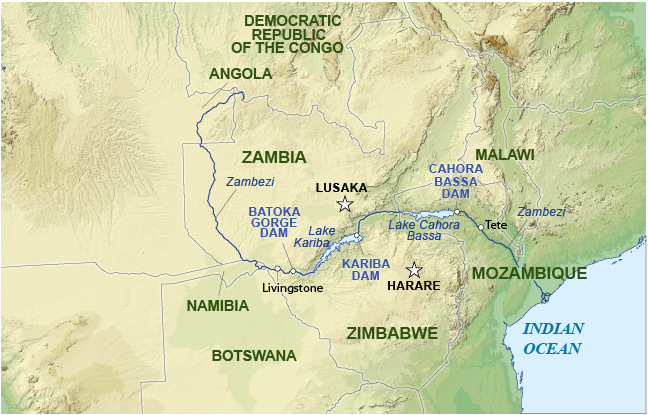 And there are plans to put up two hydropower dams between Tete and the Zambezi Delta. But increasing droughts due to climate change throw into question whether these structures will ever deliver the power they promise. All is not lost. The river is a resilient place, and even along denuded stretches of the river, life abounds. Lake Kariba’s south shore and the surrounding parks, stretching from Matusadonha to the Mana Pools game reserve, were designated a UNESCO Biosphere Reserve because of the huge animal diversity that they support. And the delta continues to be home to a considerable wildlife and birdlife population, including some endangered crane species. But one of Africa’s most iconic rivers, a gem of the eastern side of the continent, is unquestionably at a tipping point. 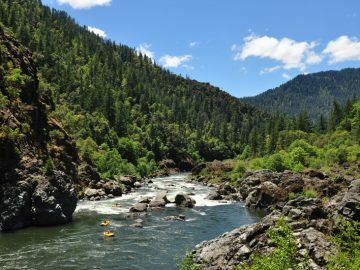 As uncontrolled land grabs, huge planned diversions, and dams threaten it, the river’s ability to support all these proposed developments is uncertain, especially with climate change knocking on the door. Better energy solutions exist for Africa; much of the region is ripe for solar power, which is quicker and cheaper to install, and has fewer social and environmental impacts. Zambia is already looking to solar to make up for the energy shortfall caused by Kariba Dam. Each November, when the Zambezi’s waters are low, the Lozi people make the reverse journey back to the plains. The ceremony is called “Kufuluhela.” In the narrative of this ritual, the king – who has led his people to higher ground spiritually and physically early in the year – leads his people back down to a land of plenty, a land that’s been nourished by the season’s floods and will now produce food for the people. 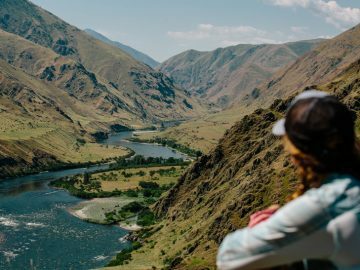 It is a powerful metaphor, and an even more powerful truth – by living in harmony with the river, the river will provide. Can we ensure that the river the Lozi return to, the river they revere, will continue to be the life-giving force it is now? International Rivers, together with their partners, is working tirelessly to promote better water and energy solutions for the region. They’re also working to prevent further dams and promote the recovery of this incredible, life-giving waterway—as well as others around the world. You can help. Donate money to International Rivers’ Zambezi campaign to help protect this river from risky development schemes. We can protect this river before it’s too late! This article appears in the OARS 2017 Adventures Catalog. For more tips and travel inspiration, request a free copy. 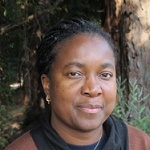 Rudo Angela Sanyanga is the Africa Program Director for International Rivers where she provides advocacy and analytical support to African communities and NGOs working to protect themselves from the destructive impacts of large dams.